Organize Your Closet in Three Easy Steps! 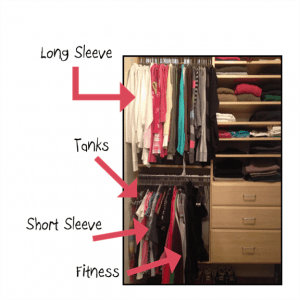 Is your closet out of control? Do you need a new house with bigger closets? It’s time to get relentless! Take everything out of your closet. I know, I know, it’s such a pain but it’s so much easier to be relentless this way! Try everything on. If it doesn’t fit right, feel right, or look right it’s time to say good-bye. Be relentless! If you’re at maximum capacity there isn’t room for anything new. Make a Rainbow! 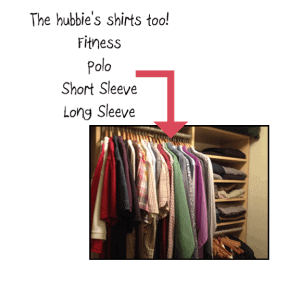 Put your ‘keepers’ back in the closet on uniform hangers. I use these chrome hangers and love them! So much better than plastic and space saving too! For my husband’s clothes I use wood hangers for a crisp look. Place ‘keepers’ in rainbow order by shirt style. Tank tops together, short sleeves, long sleeves, and fitness (or whatever category you need). Start with whites then move to red, orange, yellow, green, blue, purple, and end with browns, greys, and black. That’s it! You’re done with hang ups! Don’t you feel good?! Now wear all of those clothes! I know you found some you forgot about! When the Mood Strikes, Deep Clean the House! The Garage Wall of WOW! Get That Laundry Done Without Letting It Take Over Your Life!